Dixon Hall Employment Services Centre is a non-profit organization committed to providing employment and career services for those in need. We helped DHESC develop a content management system that helps staff efficiently change and modification of content regularly. Give our marketing consultant Paul Cookson a call at 1-888-586-2860 to discuss any of your website or marketing needs. Dixon Hall is a great case study on web design for Charities. This vital non-profit employment resource serves the community members of East Toronto's Regent Park area. Dixon Hall assists with career searches, provides one-on-one support, and access to job training programs, in addition to holding employment-related events. They also provide Toronto businesses, government agencies, schools and more with a full spectrum of Human Resource services, helping them connect with qualified job candidates that match their needs. At the time, the Dixon Hall website was badly in need of an overhaul, both aesthetically and for improved usability. Ultimately, the intent was to increase visitor engagement, thereby better serving the community. Dixon Hall was also looking for other ways to spread the word about their job services and generate brand awareness for job-seekers and employers. To make it all happen, they sought the services of marketing expert Toronto, Paul Cookson, CEO of AdArmyGroup, a full-service digital advertising and marketing agency with a reputation for award-winning web design and innovation. AceWebDesign, a division within AdArmyGroup specializes in delivering WOW-factor web design for Charities, as well as for-profit companies. They have a great track record for getting desired results. Marketing expert Toronto, Paul Cookson and his team met with the Dixon Hall team. The AceWebDesign team are great listeners; they know it's key to understanding a company's needs, goals and vision for a project's success. Client and agency agreed; tackling the website makeover was integral to Dixon Hall's community outreach. Today, every business including non-profits need a powerful online presence. Indeed, it's essential to have a fully optimized website that ranks high on search engines. Plus, once visitors are on the site, they need it to be an easy-to-use job resource tool. 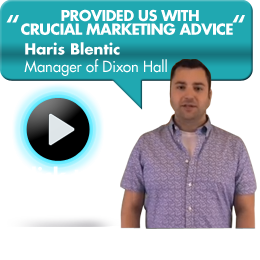 AceWebDesign, marketing expert Toronto worked closely with Dixon Hall, every step of the way. You can see the results of Dixon Hall's website makeover right here if you haven't already. It's modern, clean design is easy on the eyes and easy to use. The upbeat orange and white colors convey a bright, optimistic vibe throughout each site page. The universal navigation tabs across the top make it easy for site visitors to find exactly what they're searching for. Clear, concise messaging and calls-to-action engage visitors so they know exactly what to do next. Featuring an actual community job-seeker in the main photo conveys Dixon Hall's 'We're here for you' vibe. These are all best practices of great responsive web design. Of course, you can always count on marketing expert Toronto, Paul Cookson and his team to lead the way on best practices for professional web design for Charities. Plus, the AdArmyGroup team are pros at search engine optimization by helping your website rise through the rankings to be seen and clicked on. By employing simple yet highly effective design strategies, they make it easy, even for non-computer users to engage with the Dixon Hall site. Marketing expert Toronto, Paul Cookson takes an avid interest in his clients' success. In fact, he visited Dixon Hall to provide his expert marketing advice, and give an in-person on-site talk to job-seekers on pursuing marketing careers and web design for Charities. It's just another example of AdArmyGroup going the extra mile for their clients. The Dixon Hall client was so pleased with his AdArmyGroup experience, that he's featured in a video testimonial that you can access here. In fact, video production is also a service, and an exciting tool that marketing expert Toronto, AdArmyGroup can provide for your organization. Your website is a representation of your brand and business identity. If you're not seeing the response rate that you want from customers, it might be time for a site makeover with AdArmyGroup's experts in web design for Charities. Let Dixon Hall's website makeover serve as inspiration for your own unique website, designed specifically to meet your needs. So when looking for web design for Charities, count on the marketing expert Toronto, Paul Cookson and his team to fulfill your organization's needs. You can expect the same individualized attention as their high-profile clients, including Toshiba, RE/MAX, Darryl Sittler, Eric Lindros and more, at an affordable price. Also, feel confident knowing Paul has 20+ years of experience in sales, marketing and entrepreneurial ventures that's proved quite advantageous in developing web design for Charities. So call AdArmyGroup for a free consultation with marketing expert Toronto, Paul Cookson today at 416-286-2860.